If you are health conscious you probably having fish or vegetable dishes most of the time. Preparing the food can be fun and fulfilling but the need to descale, gut and clean the fish is not fun at all. We will make life easier for you by presenting to you the best fish scaler in the market today. Included in this article are 5 popular brands of fish scaler that you can consider buying. The Yamasho Brass Fish Scaler is a lovely Japanese inspired scaler. The handle is made of wood and the head is from brass. The best thing about having a wooden handle is that it is easy to hold for fast and comfortable fish scaling process. It is pretty sharp requiring some effort from the user. The skin is intact after the tool removes the scales from the fish. Most of the scales were removed with the use of this Brass Fish Scaler. To effectively remove the scales from the fish do it underwater. Fill the kitchen sink with water, then position your fish underneath and start removing the scale. To maintain the sharpness and the quality of the Yamasho Brass, you need to wash it after using and then let it dry before placing it in the drawer. This sturdy aluminum fish scaler has an attractive design. It is shaped like a fish and with raised nubs on the side for lifting and clearing the scales. For a firmer and better grip, it has a curved handle that even if you have sweaty hands it will not be a problem at all. Using this scaling tool is very easy, all you need to do is to lay the fish on a flat area and hold it firmly. With a short stroke, scrape the scales from the tail to the head. Rinse the fish thoroughly using cold water. This fish scaler is very handy because it is small enough that you can place it in your bag, and take it along with you during your fishing or hiking adventure. Use warm water with some soap in cleaning the scaler. This stainless steel Amison Am-Remover is very durable and lightweight. It is easy to handle so you will not have any problem during the scaling process. The Amison fish scaler has a special feature that will prevent cutting your hands or fingers. Handling the tool is easy as it has a hook ring design for easy handling. Cleaning is easy as well, you either hand wash it or just place it in the machine. The sawtooth is sharp enough to remove the scale easier and faster. 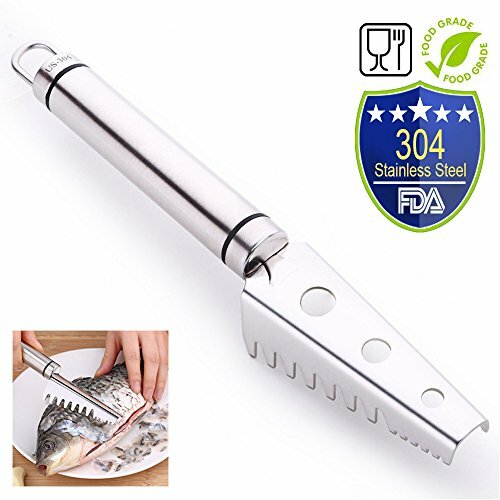 With this tool you can remove any size of fish scale without hurting your hands, it is much better and safer than using a knife. Because it is made of Premium 304 stainless steel, rusting is not a problem at all. It has anti-rust properties which are non-toxic and approved by the FDA. The Big Norm-Feets 88111 Magic Scaler is one of the sought after fish scaler in the market today. Because it is made of premium quality plastic, the tool is rust-free and very durable. It is proudly made in the USA so you are assured that it is built with quality. It has a free-floating fingers feature which makes removing the scales fun and easy without scales flying in different directions. This type of fish scaler is less expensive as compared to another type of scaler. Because it is light and easy to handle the scaling can be done fast without any difficulty. After using the scaler wash it with soap and water. You don’t have to worry about flying scales because you will not experience it at all. If you are looking for a fish scaler that is purely made in the USA, the Sea Striker Fish Scaler is what you need. The brand is known for quality craftsmanship and materials ideal for scaling different kinds of fishes. It is very handy that you can bring it during your fishing adventure. Just like other brands, it is safe to use. Cleaning it is also easy, all you need to do is to wash it with soap and water. You will not experience flying scales when using this fish scaler. It is priced reasonably, so it will not be an issue if you are after the price. In maintaining this tool, make sure that you clean it thoroughly every after use before storing. Applying oil on it is also helpful to make it last longer. Just like another fish scaler this brand is durable enough to last for many years. Kwizing fish scaler brush can help you remove scales easily and safely without any difficulty as compared to using a knife. As compared to other low-quality two blade scalers, this fishing tool has the wider surface area with 32 serrated sawtooth that will provide even and clean scale removal, even those hard to reach areas on the belly and fins. The handle is made of a non-slip ergonomic material which is comfortable to touch. If you catch a big fish, there are lots of scaling required and since it is comfortable to use it will make the job easy and fast. One of the characters of a good fish scaler is the absent of flying scales. The Kwizing sawtooth is designed to catch loose scales without scattering all over the place or on your clothes. The tool is backed by Japanese craftsmanship and impressive customer service, and because of this, the company offers a complete satisfaction guarantee. With Bicco Plastic Fish Scaler you will not experience any flying fish scales. You can keep these scales away in your boat or deck using this no-mess scaler. This fish scaler is safe to use. It may be sharp on the fish scales but it is safe on your hands. Because of Bicco’s compact design, it is helpful in tossing it in your tackle box and carry it along during your fishing adventure. You can do the scaling all day from your fishing trip haul without any difficulty. Bicco Fish Scaler is lightweight and very handy. Using this does not require too much effort. Cleaning the fish scaler is easy, simply wash it with dishwashing soap and water. Make sure to clean it after using it. 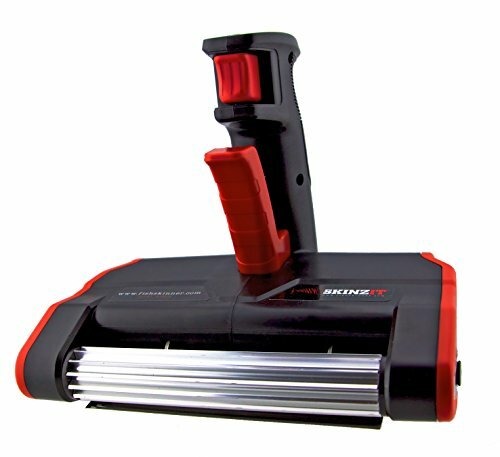 Skinzit is an electric fish scaler that works in removing the scale as well as rib bones to leave the meat intact. It reduces the time of cleaning by half. Maintaining this tool is easy it only takes a few minutes to understand how it works. Skinzit has durable parts. Its floating blade is stainless steel, and the intake wheel is corrosion free. Since this is an electric fish scaler, don’t forget to unplug it. To clean the tool unplug it and then wash or wipe the blade. You can use it indoor or outdoor as long as there is an electric supply. All the qualities mentioned are essential in buying a fish scaler. The number of fish for scaling is the first thing you need to consider. If it is for commercial use, choose the one that can handle a large amount of fish. For household use, a standard or regular fish scaler can help you a lot. Determine the number of times you need to scale your fish. Are you going to use it on a daily basis or one a week or yearly? For those who are into fishing industry and need to scale fish every day, then you need a durable scaler that can withstand a huge amount of uses. The tool can help you a lot not just in helping you complete the job fast but it will also help you earn a good amount of money. It is important that you choose a durable scaling tool. Buying the cheapest, low-quality fish scaler is not a good idea. Instead of saving a good amount of money, it will be the other way around since you need to purchase a replacement again and again. Choose a rust-free and corrosion free scaler. Scaling can get messy and hard to clean up. This is particularly true if you use a knife in scaling the fish. Choose a tool that will not give you a hard time cleaning up. Some scaling tool can capture the scales leaving less or no mess. Just empty the accumulator and clean the scaling tool. For those who are using the tool every day, this factor is important. Using a wrong tool in scaling can cause hand blisters, as well as other body, aches particularly those that need to scale a fish every day. Find a tool that is comfortable to use. If you check online, you will find a number of a good product like non-slip grip scalers that is comfortable to use. What are the different types of fish scalers? The different types of fish scalers include scraper or brushes, peelers, electric scalers and drill bucket scaler. 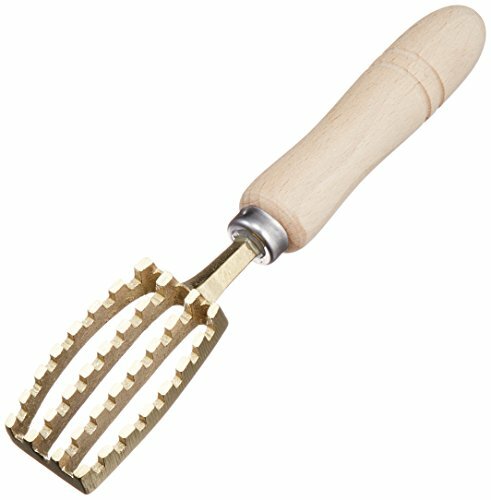 How to clean a fish scaler? Cleaning your fish scaler is easy, for metal scaler wash it with fresh water, remove any dirt or debris, then apply some protective oil to prevent rust or corrosion. For fish scalers with wooden handle, never soak the wooden part in water to keep it dry. Plastic scrapers can be washed with soap and water and store it in a dry place. How to use the fish scaler properly? Hold the tail of the fish firmly and using your scaler, scrape the scale from the tail to the head of the fish. Use long strokes and go against the direction where the scales are growing, this will flake off fast. Scale the back and the fish belly. This will also help reduce bacteria, which also increases the fish shelf-life. Then wash it off thoroughly. Which is more reliable an electric, plastic, stainless steel or aluminum fish scaler? It depends on how frequent you will use the scaler. If you need to use it every day, choose the one that can withstand the daily use. We highly recommend is Yamasho Brass fish scaler, not only because of the price but also due to the efficiency of the product. It can remove the scales evenly without damaging the fish skin, thus you can make the dish presentable. However, if you will be using it for your everyday work, this could not be helpful to you. An electric fish scaler can make the scaling and cleaning your fish faster and easier. If you think this fish scaler review is helpful to you, feel free to share this post to others or you can make a comment below.